Nintendo has finally launched the 3DS' first paid DLC (for a game you've never heard of). Tobidasu Print Club Kiradeco Revolution is a Japanese 3DS app that functions somewhat similarly to the classic Game Boy Camera. You take pictures, use the barebones editing suite to alter their appearance, then share them with friends. It's a gimmick, is what I'm saying here, but it's also the first program to feature paid DLC on the company's latest handheld. The app, which was first released on December 27, received three pieces of download content yesterday. Players can download sets of decoration parts for use in decorating pictures. 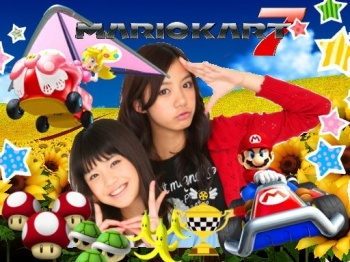 The Mario Kart 7 set, Spring Trial Set and Mario Basic Set each sell for Â¥100, and each includes frames, backgrounds, and stamps. I've embedded an image of the DLC above, but those of you who are totally enthralled by the 3DS-equivalent of Nintendo-themed stickers can hit up the Andriasang piece for a more comprehensive gallery. Why did I not simply post the images here? In sum, they're terribly dull. One would think that Nintendo would want to make a big splash with its inaugural paid DLC -- maybe new courses for Mario Kart 7 -- but instead the publisher proves, once again, that it is depressingly hestitant to embrace online initiatives that became de rigeuer half a decade ago. Maybe by 2015 Nintendo will have something interesting to show us.